But it would prefer to give players a choice. Update: THQ Nordic has clarified its position on Metro Exodus being an Epic Games Store exclusive. Yesterday, the publisher said it wouldn't comment on the deal, which was made by its subsidiary, Koch Media. A post on the investor website, however, does go into more detail, breaking down the structure of THQ Nordic and its subsidiaries and supporting the time exclusivity deal. You can read CEO Lars Wingefors' statement below. I fully support our sub-groups’ autonomy to run their respective businesses. I believe it’s in the group’s, and ultimately the consumers’, best interest that business decisions are made close to the market and this is the group’s consistent business model. I have noted that there is some confusion about the two different THQ Nordic entities, the parent company and the operating entity in Vienna. As already communicated to shareholders last year, the parent company will change its name to better reflect its status. Original story: As Epic attempts to carve out a digital retail kingdom, we’re probably going to see more Epic Games Store timed exclusives like Metro Exodus and The Division 2. 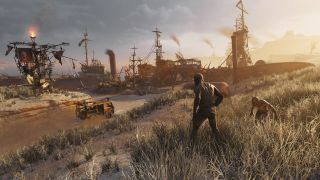 THQ Nordic, which acquired Koch Media and Metro publisher Deep Silver in 2018, says the decision to sell the post-apocalyptic shooter exclusively on Epic’s platform was Koch Media’s, but it isn’t completely ruling out similar deals for other games. Despite the acquisition last year, Koch Media is still separate from THQ Nordic and controls the Metro IP, which it acquired from the original THQ, along with the likes of Saints Row. This family tree gets more confusing every year. THQ Nordic said it had no comments to make about the deal, but did briefly clarify its position on timed exclusives in general. Epic exclusives have, so far, consistently been followed by angry comment threads and calls for boycotts. While this isn’t necessarily indicative of the general feeling towards these deals, they’ve certainly riled a lot of people up. Amid the feverish brand loyalty and exaggerations are plenty of genuine concerns. The Epic Games Store is very short on features at the moment, and the user experience leaves a lot to be desired. One of the responses to THQ’s statement points out that the absence of support for their currency makes it harder to buy games, and it’s just one of a multitude of things that the store lacks right now. THQ Nordic released Darksiders 3 on both Steam and the Epic Games Store, and presumably we'll see more of that, but the revenue split and terms of the exclusivity deals must be pretty tempting based on what we're witnessing right now.